Bishopwood West Ii Forest Glen Condos: First time on the market, original owners! Nicely updated 2nd floor spacious 3 bed, 2 bath end-unit with a beautiful lake and golf course view. Desirable split bedroom floor plan with large owner’s suite with sliding doors to lanai, and private guest suite. Renovated kitchen with a granite countertop, tall cabinets, stainless steel appliances and matched backsplash. Nicely remodeled owner’s bathroom. Plantation shutters in all bedrooms and electric hurricane shutters on the lanai. Wood floors in the owner’s bedroom, entrance hall and stairs; diagonal tile in living, kitchen, dining, & bathrooms areas. Crown moldings throughout and extended 2 & half-car garage which could fit 2 cars and a golf cart. Tiled and very private lanai with the popular SE exposure. Not to mention the neighborhood pool and mailboxes are located steps to your front door! Play golf at the ranked #1 in the country in 2016 by Golf Advisor for the Best Course Conditions! Bishopwood West Ii Forest Glen Condos: Absolutely gorgeous unit overlooking the first fairway. This is an 18 hole Bundled Golf (Arthur Hills golf course) community. Clubhouse, lounge and poolside tiki bar, restaurant. Fitness center, pools and spa, jogging paths. Great location - minutes to Marco Island, downtown Naples and beaches. Forest Glen Condos: Well maintained 2 bedrooms, 2 full bathrooms plus a den, located on the 8th green. Large lanai across the back of this home. Electric storm shutters on lanai and entry. Great community and Golf course to enjoy. Barrington Ii Forest Glen Condos: Desirable first floor coach home (condo) with a 2 car attached garage. Offered Turnkey, furnished 3 bedrooms/2 bath. High impact windows and doors. Quiet Preserve View. Golf & Tennis membership included. Guard at gate. Nature trails, gym, restaurant, pub, and poolside bar & grill. Perfect place to spend the Winters. Bishopwood West I Forest Glen Condos: Over 1800 square feet of living in this first floor coach home. This property overlooks the pond and 6th green of Forest Glen Golf & Country Club. The unit is next to an open park like area lending peace and tranquility. The master bedroom suite is large enough for a sitting area. The master bath has his and hers sinks, walk-in shower, soaking tub, and large vanity. There is also a formal dining room, den with French doors and private guest bedroom and bath. The kitchen has a breakfast area that overlooks screened lanai, pond and golf course. Electric hurricane shutters has been installed on the lanai. Forest Glen is a full amenity club with 18 holes of golf, 4 Har-Tru tennis courts, fine,pub and poolside dining and the most welcoming members. Call today for a private appointment! Bishopwood East I Forest Glen Condos: Spacious, open floor plan. Great for entertaining. South facing lanai overlooking award winning golf course. Golf & Tennis membership included. Guard gated, restaurant, member pub, poolside bar & grill. Fitness center, golf & tennis pros, nature trails and very friendly members. Home service contract that can convey to the buyers. Bishopwood East Ii Forest Glen Condos: Beautifully maintained condo is located in this very desirable bundled golf community that offers a peaceful landscaped view. This 2+den offers an open spacious interior with 9 ft ceilings, neutral tile throughout with carpeting in bedrooms, tiled lanai, and impact resistant windows. Den features built-in wall cabinetry and master bedroom has a bay window, two spacious walk-in closets and master en-suite bathroom has a separate tub and shower. Furnishings Negotiable. Unit comes with a 1 car detached garage too! This community offers a wide variety of amenities that contribute to its fabulous lifestyle with its resort style pool, lighted Har-Tru tennis courts, updated fitness center, 2 miles of nature trails, casual and fine dining, cabana bar and grill with numerous social events. Well located in the heart of Naples! Forest Glen Condos: Spectacular condo with a wonderful golf course view! (6th Hole Fairway) Offering almost 1,600sf of living space, this first floor unit features a great room & split bedroom design, lots of storage w/ dual walk-ins in master, large pantry, linen closet in guest wing, & shelving in utility room, large panel sliders (impact glass), 1-car detached garage, and a screened lanai overlooking the golf course. The Bishopwood community pool w/ BBQ station is just down the road from this home and offers a peaceful lake view. Forest Glen, a full service golf club, is situated in Naples on over 630 acres offering an 18 hole award winning golf course, tennis courts, swimming pools, state-of-the-art fitness center w/ classes, fine dining, meeting/banquet facilities, and bike/jog paths. Britannia Iii Forest Glen Condos: Outstanding 2nd floor end unit condo. Two bedrooms, plus Den allows for over 1500 square foot of living space. This unit is being sold completely furnished. Upgrades include moldings, plantation shutters and high impact hurricane proof windows and doors. The private screened lanai overlooks the lake with water feature and the 4th and 5th fairways at Forest Glen Golf & Country. This unit is immaculate and shows like a model. Forest Glen is a resort style club. Besides the 18 hole Arthur Hill Golf Course, the active tennis league plays on 4 Har Tru courts. Members also enjoy fine, casual and pool side dining plus many fun activities year round. 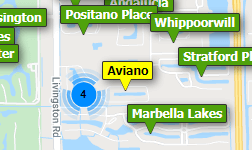 Conveniently located just 8 miles to 5th Ave South, Naples fine beaches, art museums and shopping. Call today for a private viewing. You won't be disappointed!! Bishopwood West Iii Forest Glen Condos: Guess what?! Now when you buy this first-floor condo, fully furnished, on the fourth hole of the Forest Glen Golf Course you get not only a home warranty but a GOLF CART too! Wow! What more could you want? Calling all Golf Lovers, this is the condo for you! Are you ready for the golf life? Need a little more sunshine in your world? Is Naples calling you? Then this property in beautiful, gated, Forest Glen is one you need to check out. Owners are selling it fully furnished, all you have to do is move in. Located on the fourth hole of this bundled golf community. Right on the lake, you will enjoy everything Florida has to offer. This first-floor condo features two bedrooms plus a den. Two full bathrooms. Along with an interior laundry room. Home has only been occupied for a few months each year and is in pristine condition. Thoughtfully priced and ready for a new owner to call home. Come check out everything Forest Glen and this condo have to offer, you won't be disappointed. Sellers are providing a home warranty as well, ask about the details! Bishopwood East I Forest Glen Condos: Pristine condition! 1st floor garden home with a garage.Two beds plus a den. Offered beautifully furnished, turnkey. Many upgrades & updates. Bamboo flooring in bedrooms. Tile in the main living area and den. NO RUGS. Tiled Lanai. Updated AC and water heater. Faucets and lighting have been updated. Golf and tennis membership included in an award winning golf community. Guard gated, restaurant, member pub and resort style poolside bar and grill. Nature trails to hike and bike. Fitness center. Don't wait, enjoy Naples, Fl this Winter. Bishopwood East Ii Forest Glen Condos: Pristine 2+den second floor condo with golf course views. Near the end of the cul-de-sac for privacy. Retractable screen front door enables a cross breeze through the lanai. One car detached garage can hold a golf car, car and storage. Impact glass (hurricane resistant) windows and sliders adds to your peace of mind. Forest Glen is a full service club with Golf, Tennis, Swimming Pools, Spa, State of the Art Fitness Center, Restaurant, Member Club and Eagle's Nest poolside bar and grill. Paved path through the preserve for biking, jogging or enjoying nature. Guard gated community. Bishopwood East I Forest Glen Condos: Wonderful Southern Sunny views of golf course, lake, and fountain from this beautifully maintained first floor Garden carriage home. 2 BR + Den, and garage. Offered Turnkey Furnished. High impact doors and windows throughout. Golf and tennis membership included. Sellers high-end private golf cart is negotiable. Acres of nature trails for jogging, bicycling. One of the best conditioned golf courses in Florida all year long. Amenities include 2 community pools, Clubhouse, fitness ctr, restaurant, pub, and new poolside outdoor dining facility. Short drive to Naples finest beaches, and 5th Ave dining and shopping. So much to offer at a great price. Bishopwood East I Forest Glen Condos: Pristine condition! Beautiful first floor garden home. Two beds plus a den/ two baths plus a garage. Great golf course view of the award winning golf course. Tastefully updated kitchen, granite counters, stainless steel appliances and white subway backsplash. New carpeting and granite counters in the bathrooms and updated lighting. Guard gated bundled golf community with a restaurant, member pub and a resort style , poolside bar and grill. Nature trails, gym and a host of social events. Golf and tennis membership included. Bishopwood East Ii Forest Glen Condos: Reduced $14,000! Beautifully maintained, this first floor residence located in this very desireable bundled golf community offers a peaceful golfcourse view. This 2+den offers an open spacious interior with 9 ft ceilings, neutral tile throughout with carpeting in bedrooms, tiled lanai, impact resistant windows, entry slide door screen, Den with built-in wall cabinetry and master bedroom with bay window, generous walk in close and 1 car detached garage too!. Spacious master bath with separate tub and shower. This amenity rich community offers a fabulous lifestyle with its resort style pool,lighted Har-Tru tennis courts, updated fitness center, 2 miles of nature trails, casual and fine dining, cabana bar and grill with numerous social events. Private cart program and debt free! Well located to Marco Island, downtown Naples and the beach. A definite must see! Bishopwood East I Forest Glen Condos: This pristine condo rents easily in season or would make the perfect annual residence. The spacious 2 bedroom 2 bath design with a den features newer furnishings, upgraded countertops, plush carpeting, a 1 car garage, and a location that is tops in Naples. The Naples lifestyle awaits affordably in this stylish and up to date Forest Glen condo featuring of the finest golf courses in all of Collier County. Forest Glen features Championship courses nestled among the large and spacious pools and the grandeur of wide open Country Club spaces. Downtown Naples and its world class shopping and dining on historic 5th Avenue are just a few miles away for your enjoyment as well as ALL that the Naples lifestyle has to offer locally. World renowned cuisine and some of the best beaches on the West Coast await you in the South West Florida gem. The dishwasher is a year old and the AC unit is just 3 years old. Forest Glen Condos: This Lakeview condo in Naples, offers guests a shared pool, hot tub, and tennis, as well as access to on-site golf and a fitness room. Other amenities include a private washer/dryer, cable, and central AC. A/C unit, Dishwasher and Hot Tank are brand new. Currently rented on a monthly basis through a professional property management company. Income producing property, great for investors! Bishopwood East I Forest Glen Condos: Adorable, well cared for, two bedroom/ two bath , 1st floor condo with a garage. Offered Turnkey. Very nice furnishings. New living room couches. Updated AC, fridge and dishwasher. Purchase of condo includes a full golf and tennis membership in the award winning golf community of Forest Glen. Guard at gate, restaurant, pub and a resort style, poolside bar and grill, putting green and aqua driving range. Miles of nature trails and very friendly members. Bishopwood East Ii Forest Glen Condos: Forest Glen Golf and Country Club This Condo has Views on the 4th hole. It has SW exposure, Turnkey Furnished, 2 bedrooms plus den over 1400 sq. ft. A/C. Includes One car garage. The Golf Club has a beautiful clubhouse with pool, restaurant, lots of jogging and walking paths, tennis and many social functions for one to enjoy. New A/C unit in 2018, New Water heater in 2016 A super location with just minutes to downtown Naples 5th. Ave. and 3rd. St. Shopping, Restaurants, Naples Pier and Beautiful Naples Beach. Britannia I Forest Glen Condos: Beautifully Maintained 1st floor condo. This 2 BR + 2 BA "Carlisle" model features a spacious open floor plan, tray ceiling, and corner lanai. Offered Turnkey furnished, and move-in ready. Upgrades Galore. Granite counter tops throughout, plantation shutters on all windows. Large tile flooring in main living areas, and laminate floors in the bedrooms. Crown moldings, updated lighting and ceiling fans. Lanai has storm enclosures. Golf and tennis membership included. Acres of nature trails for jogging/bicycling. Amenities include community pools, clubhouse, restaurant, pub, and new poolside outdoor dining facility. A must see, with so much to offer. Bishopwood East I Forest Glen Condos: Condo with marvelous golf course view! Enjoy your own play or watch others putt from your own lanai. This 2 bedroom/2 bath, first floor condo with a garage, is located in the Award Winning bundled golf community, Forest Glen. This is the lowest priced Forest Glen condo that has a garage and also includes furniture! Be sure to schedule a private showing to see this cute condo or stop by an open house. Forest Glen includes acres of nature trails for jogging or bicycling and the amenities include: clubhouse, two pools, fitness center, restaurant, pub and poolside bar and grill. Golf and Tennis memberships are included. Naples shopping, restaurants and beautiful beaches are just a short drive from this community. This home has much to offer at a great price! Britannia Iii Forest Glen Condos: Impeccable, Move-In Ready and Tastefully Appointed Condo with South Western Exposure from your covered Lanai overlooking a beautiful Lake and Golf Course View! This 2 bedrooms, 2 bathrooms condo has a covered carport conveniently located close to the elevator and a spacious locker storage. The unit has impact resistant front door and windows, an updated hot water heater, tile in the main living area and laundry facilities inside the unit. The kitchen has an eat-in nook area, granite counter top, updated kitchen appliances, double sink and a pantry. The Owner's suite has 2 walk-in closets and the master bathroom has 2 separate sinks, a spacious shower and a linen closet. Forest Glen is a bundled golf community which also offers Har-Tru tennis courts, beautiflul nature trails, biking, walking and jogging, exercise room and community pools. Enjoy the poolside casual restaurant, pub and grill or fine dining in the club house. This is Florida lifestyle at its best, located about 20 minutes to Olde Naples where you can walk Naples white sandy beaches, shop, dine and enjoy many social activities! Is this what you have been dreaming of? Call Today! Britannia I Forest Glen Condos: Motivated Seller! This is the Perfect Golf Vacation Condo! First Floor Condo, Offered Turnkey and a Golf Membership is Included! This ground floor condo is SUPER CLEAN, meticulously maintained and move-in ready. His and Hers Sinks in Master bath. Forest Glen Golf and Country Club is the place to be if you want friendly people, superior golf, tennis and first-rate dining options. It is a bundled golf community offering a variety of outdoor sports activities and a busy Active Adult Social Calendar. Only 1 mile to I75 and 15 minutes in either direction to Downtown Naples or Marco Island. This condo is clean, quiet, well kept and easy to show! Call today for your private showing! Britannia I Forest Glen Condos: Second floor Bradford unit offering a peaceful view of the lake and golf course. This property is being sold furnished including all dishes, glasses, cookware and more. Forest Glen Golf & Country offers many amenities to its members. The Arthur Hills designed golf course has been rated #1 best conditioned course by golf The very active tennis members enjoy the game on 4 Har-Tru courts. There are over 4 miles of biking, jogging, roller blading for outdoor enjoyment. This very social club has a brand new cabana/Tiki bar which overlooks the pool, 9th and 18th hole. There are also many social activities and special dinners enjoyed by the membership. FGGC is only 8 miles to posh 5th Ave South and Naples white sandy beaches. Need professional assistance selling your property at Forest Glen Naples? Find out how an Area Specialist can help to generate more property exposure in order to get the most money for your investment in the least amount of time.